Electric vehicles have never been the volume pullers, in fact not even closer to the appreciably selling vehicles. So it is evident that the demand is low and as per the latest news, the sales of electric vehicles has dropped by 75 percent since April 2012, which is very disappointing. The core reason for the dip is the withdrawal of the subsidy prior to the national action plan. Now they are demanding for an extension of the subsidy scheme till the announcement of the policy. 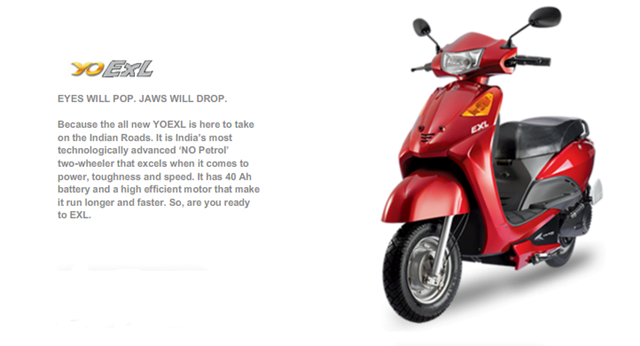 said Avinash Bhandari, joint MD of Electrotherm, the Ahmedabad-based manufacturer of Yo bykes. Sales reports of Yo bykes say that the company sold close to 80,000 units during 2011 – 12 which is twice of the number it sold in the previous fiscal year. Last year, during the first quarter the company sold 15,000 units which was a great number. At present the company is claimed to have conquered 25 % of the electric two-wheeler market. The subsidy scheme was provided by Union Ministry Of New and Renewable Energy (MNRE) that expired on March 31, 2012. As per the scheme there was a cash subsidy of Rs. 4000 – 5000 on electric two wheelers and of Rs. 1 lakh on electric cars. Registered MNRE members, who are the local electric vehicle manufacturers, can avail the subsidy benefits and then then pass it on to their customers. Some of the local two wheeler manufacturers are Electrotherm, Hero Electric and BSA Electric while Mahindra REVA is the only registered electric car manufacturer. Chief Operating Officer (COO), Mahindra Reva, R. Chandramouli says that compared to other countries, the cash subsidy in Indian is very less and he hopes that National Electric Mobility Action Plan can resolve this issue. We are looking forward to an action on this soon. We will keep you posted on the same, so stay tuned.